Baker extraordinaire, Shantilly Picnic, is famous for her Gibassier. 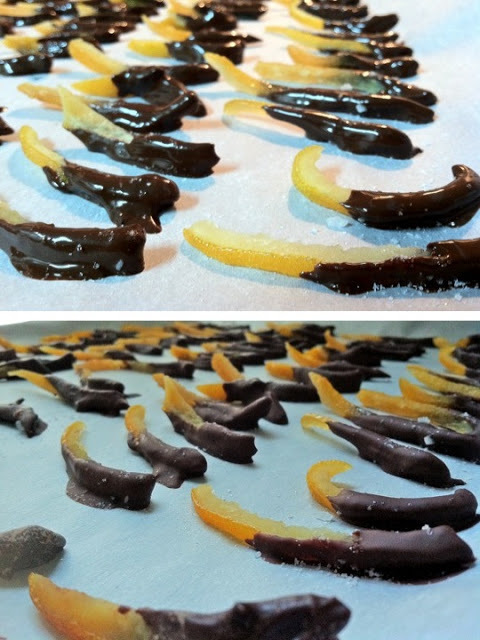 Though I didn’t dare attempt the pastry itself, the candied oranges sparked my fancy. 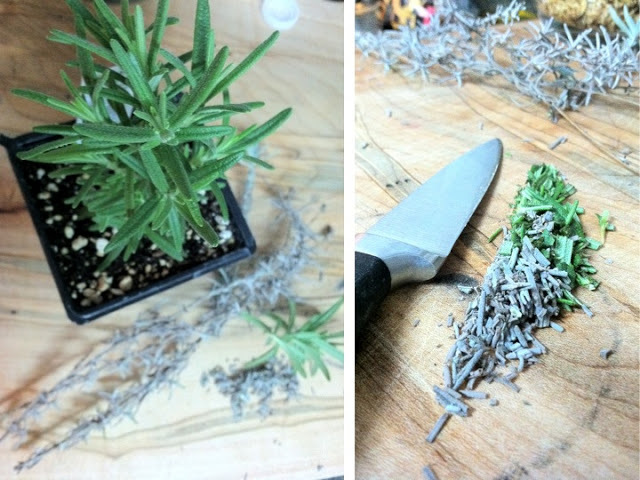 Given my lemon kick, and the rosemary and lavender sprouting in my kitchen, I forayed in a new direction as well. These candied gems have become a pantry staple; dipped in herb-infused chocolate or used to garnish savory dishes, like this Eggplant-Rutabaga Ratatouille. Craving more? Order my cookbook today on Amazon ! 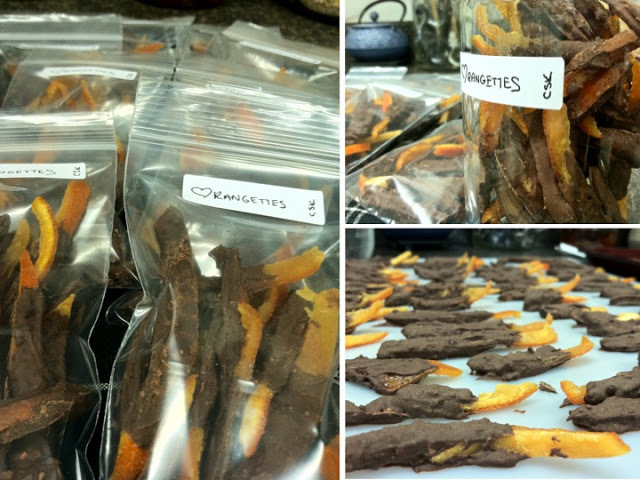 If you want to splurge a little I suggest investing in a dehydrator . Trust me, you'll use it more often than you think! 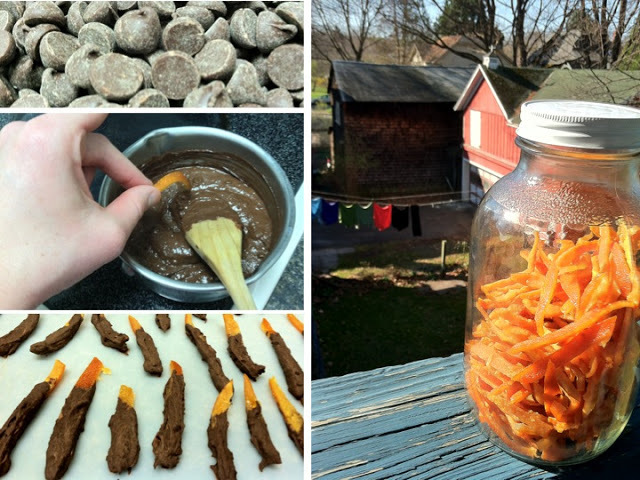 It's great for homemade chips and beef jerky. Put a medium size pot of water on the stove to boil. Meanwhile, cut the oranges and lemons in half and squeeze out all the juice; save the orange juice in a mason jar for slurping later, and the lemon juice in a jar for cooking and adding to tea and dressings. 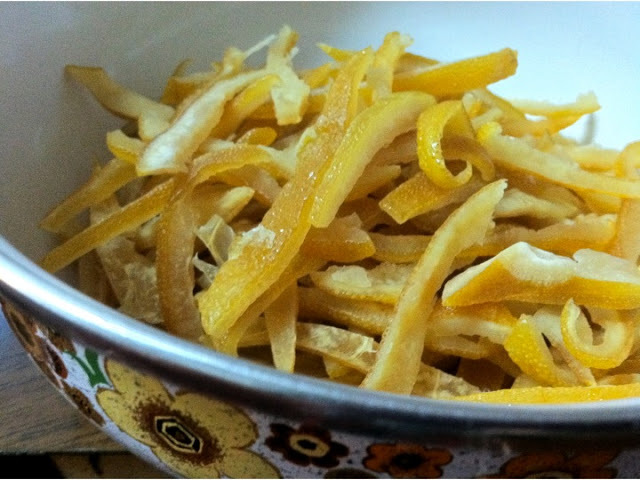 Next, cut the peels in half again, so that you have quarters from each citrus. 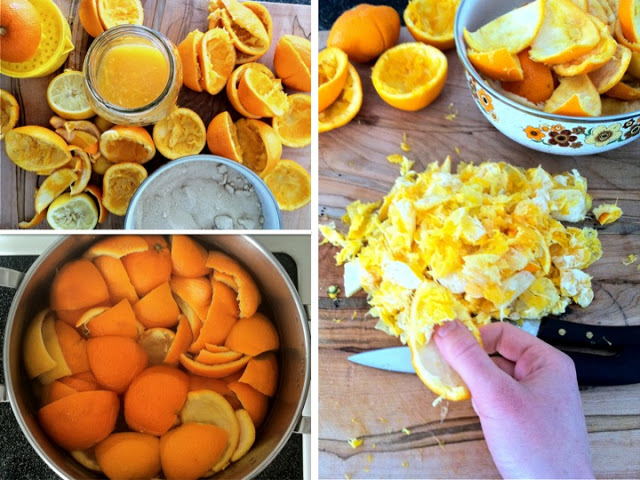 Using the back of your thumb (as pictured below), completely strip all pulp and pith from the peels. When the water is boiling, add the peels and blanch (flash cook) for about one minute. This helps remove the bitterness from the peels. Using a slotted spoon so you can save the water, transfer to a colander and drain. Use the palm of your hand to squeeze out excess water. Repeat blanching and draining again. Next, bring a large saucepan of water to a rolling boil. Add the sugar and dissolve by stirring with a wooden spoon. 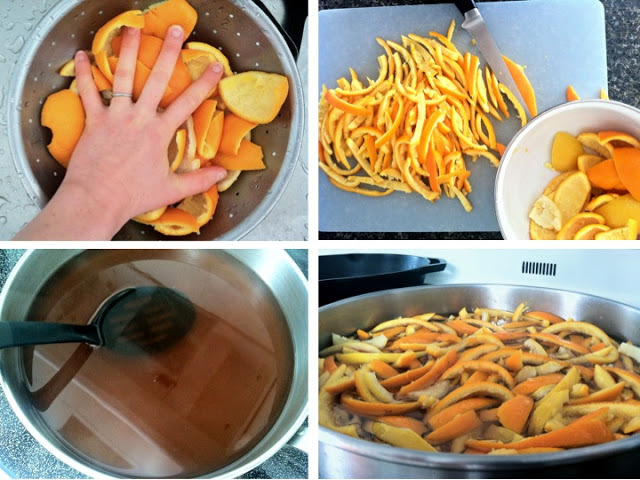 While the water is coming to a boil, cut the peels into 1/4 inch strips. Add the strips to the water and reduce to a simmer. 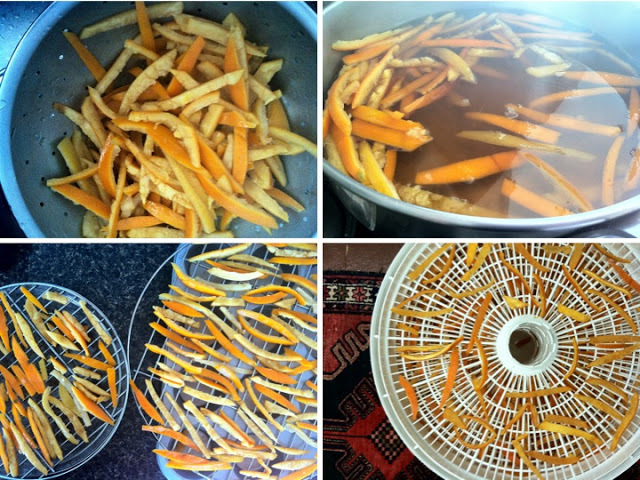 Let them simmer for about 45 minutes, or until the edges of the peels are translucent. After 45 minutes, remove the peels to drying racks, or improvise with your grill racks like I did. The goal is to have air above and below the peels to help them dry. You want to make sure they are no longer wet when you're ready to store them. Since there is lovely sugary-citrus juice still on the stove, I kept simmering the juice for another hour and a half, until it reduced into a thick syrup. 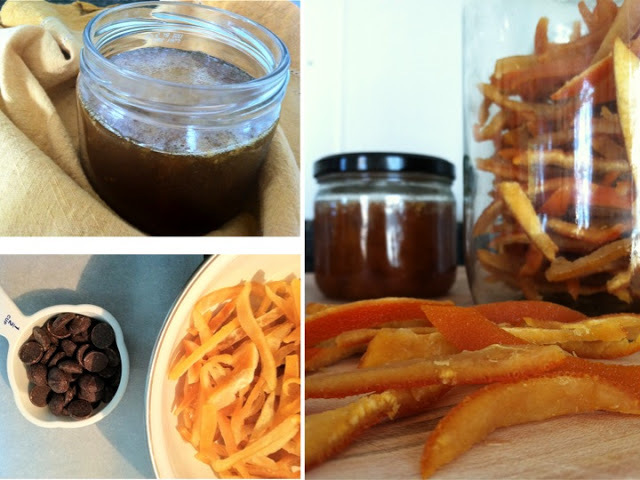 Store in a jar for using later (can be stored in the cupboard or the fridge). It will harden and crystallize, but you can scoop it out with a spoon and heat to mix into cocktails and pour over brownies, ice cream and other desserts! 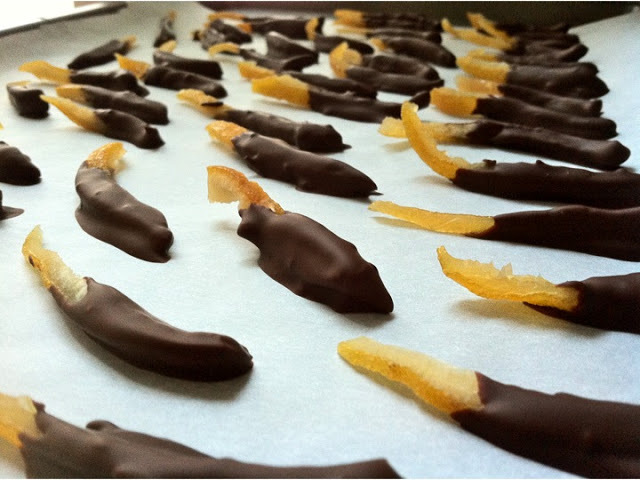 To make your chocolate, use a double boiler or two pots, one smaller than the other. Fill the bigger pot with 1 inch of water and bring to a simmer on the stove. Add the chocolate and herbs (or oils) to the smaller pot and place on top of the bigger pot resting in the water. Watch carefully so as not to burn. Stir until the chocolate is melted. 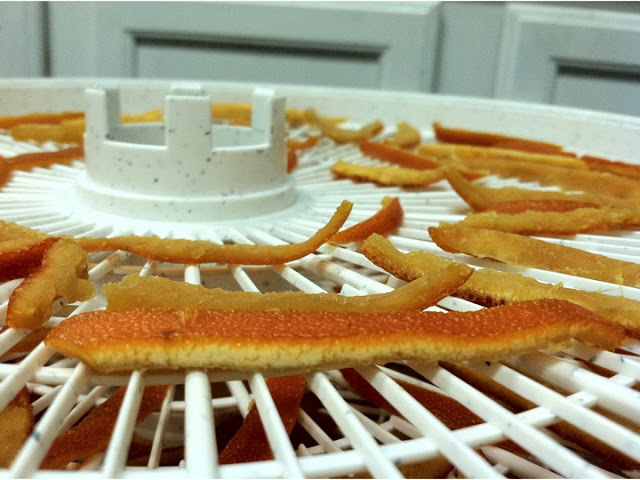 When the peels are finished, let them dry on a surface. When dry, store in an airtight container.